Six alumni were recognized with HAA Awards (during the Harvard Alumni Association board of directors’ fall meeting), for their outstanding service to the University. Danguole Spakevicius Altman ’81 of Houston, a member of her class’s thirty-fifth-reunion planning committee, has also served the Harvard Club of Houston for more than two decades, including as an alumni interviewer and twice as president. As an HAA board member, she chaired the Alumni Leadership Conference and the former clubs and shared interest groups (SIGs) committee, and has been a regional director for Texas and a member-at-large on HAA’s executive committee. As an initiative leader for alumni volunteer “ambassadorship,” she was integral to developing board “town hall” meetings to discuss topical issues and University challenges. Joseph F.X. Donovan Jr. ’72, formerly of Cambridge, devoted more than 40 years to Harvard as a student, fundraiser, and volunteer, retiring from the University Development Office principal-gifts team. In 1977, he joined the Harvard College Fund and became a driving force in fundraising for House renewal, financial aid, professorships, and athletics (he’d been an undergraduate manager of Harvard football). In addition, he volunteered for many years on the boards of the Harvard Club of Boston and the HAA, and was a member of HAA Awards and Happy Observance of Commencement committees. The devoted class of 1972 member was its longtime secretary and a member of its quinquennial reunion-gift committees. He passed away on May 14. Paul J. Finnegan ’75, M.B.A. ’82, of Evanston, Illinois, was elected to the HAA board of directors in 2004, and served as its president from 2006 to 2007, during the transitional period between the presidencies of Lawrence H. Summers and Drew Gilpin Faust. Elected to the Board of Overseers in 2008, he was named a Fellow of the Harvard Corporation in 2012, and was appointed Treasurer in 2014; he also chairs the board of the Harvard Management Company. A director of the Harvard Club of Chicago, he has served on various councils for the Faculty of Arts and Sciences and the Kennedy, business, and public-health schools. C. Ronald Ostberg, M.Arch. ’68, of Harvard, Massachusetts, remains linked to the University through his support of the Graduate School of Design (GSD) and the HAA. He chaired the GSD Alumni Council from 2010 to 2013, focusing on student and alumni outreach and ambassadorship, and introduced an alumni-mentoring program. His roles as an HAA board member included serving as member-at-large on the executive committee and appointed director for the GSD, as well as chairing the University-wide alumni outreach committee. Harold I. “Harry” Pratt ’59, LL.B. 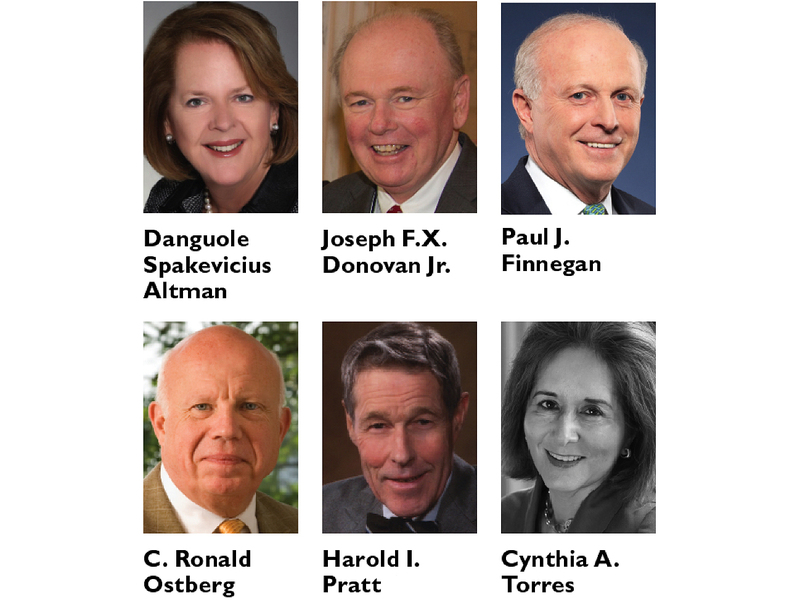 ’63, of Cambridge, is a resolute class leader, having served as ’59’s assistant treasurer since 1989, its John Harvard Society chair for nearly 20 years, and a faithful and diligent member of both the reunion-gift and -planning committees for decades. Appointed to the HAA board as a class representative in 1987, he joined the “Happy” committee and was an enthusiastic member for 25 years, long directing the cohort of alumni escorts for Harvard’s most distinguished guests at Commencement. He has also helped with fundraising for his Law School class. Cynthia A. Torres ’80, M.B.A. ’84, of Los Angeles, has dedicated decades of service and leadership to different arenas of University work, including as HAA president from 2014 to 2015. As an HAA board member, she chaired the awards and clubs and SIGs committees and the Alumni Careers and Students Task Force and served on the committee to nominate Overseers and HAA elected directors. Extensive work with Harvard clubs in Hong Kong and Southern California led to her appointment as regional director for the Pacific Southwest. She has served on reunion-gift and -planning committees for her class and been vice chair of the Harvard College Fund West Coast Council.